Just like humans, our pets are vulnerable to gum disease and problems with their teeth. Alarmingly, 80% of dogs and 70% of cats suffer from some form of dental disease by the age of three years. Firstly, you should have your pet's teeth examined by one of our veterinarians or nurses on a regular basis and if necessary, follow up with a professional dental scale and polish. Your pet needs to be anaesthetised to carry out a thorough teeth clean without distressing them. Once anaesthetised, a complete dental examination is carried out. This process involves charting all present teeth and evaluating their condition, including the degree of tartar, gingivitis (gum inflammation) and any pockets in the gums around the teeth. Our veterinarians will then remove the tartar above the gumline using a special ultrasonic scaler, just like a dentist uses for our teeth. The teeth are then polished using a dental polisher and specialised fine-grade paste. If the dental disease is not severe, the procedure will end here. However, if certain teeth are so severely affected they can not be saved, extractions will be necessary. In some cases, gum surgery is required to close the holes left behind when a tooth is extracted, and dissolvable stitches are used for this procedure. 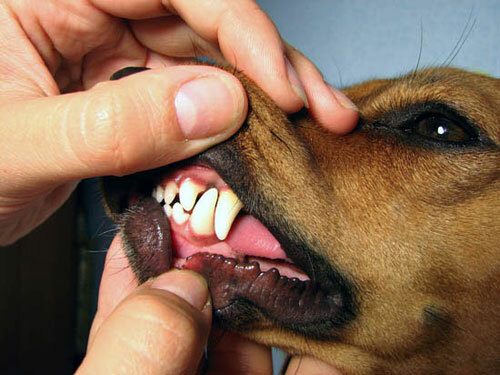 If any extractions or surgery is required in the mouth then the pets are also given nerve blocks which numb the local area and provide ongoing pain relief after the anaesthetic procedure is completed.